*Note…. I included a few links to some of the trickier supplies on the list. Those are Amazon affiliate links and if you happen to click through and purchase something, I’ll earn a ridiculously teeny commission for sending you over there. It doesn’t cost you anything extra and it really does help support our site. Thanks! Science experiments are on my list of necessary but difficult to get done activities. When we were first homeschooling, we skipped most experiments because I simply didn’t have the science supplies on hand. I forgot to put them on the shopping list. Eventually we switched to a science program which included an optional lab kit. I invested the money and purchased it. Suddenly science happened! We were able to do most of the experiments because I had the supplies on hand. The kids were delighted. In their opinion, lab experiments and demonstrations are the best part of science. Over the years, I carefully stored and kept the science supplies until we’ve built up quite a collection. With these supplies on hand, I’ve found we’re easily able to do most experiments my kids run into between kindergarten and 8th grade. I only have to keep an eye out for the consumable items such as apples, red cabbage, and bread that are needed once in a while. In the summer I double check supplies like balloons, straws, and aluminum foil to make certain we’re set for the new school year. Here is a list of the science supplies I keep in my science kit so you can create your own science kit. 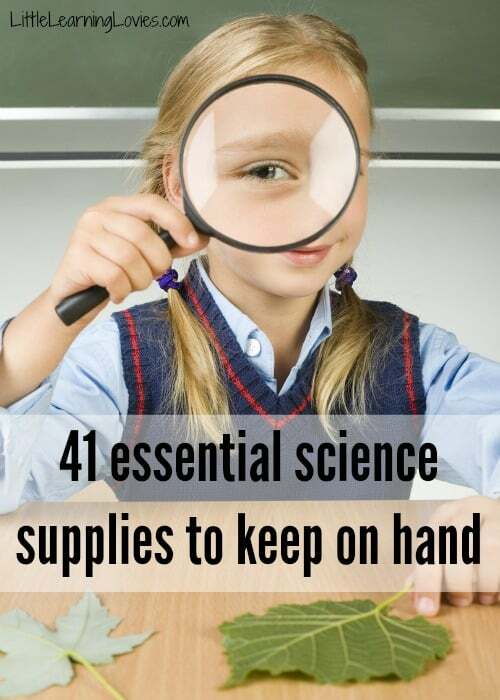 Do you keep a science kit for your homeschool? Sara Dennis is a homeschooling mother of 6 children ages 4 through 18. After much research into homeschooling in 2000, she and her husband fell in love with classical education and used it as the foundation for their homeschool. Sara Dennis blogs at Classically Homeschooling. Thank you so much for this! I saved the PDF and I’ll be putting together a supply kit. This is great! I rarely have what I need when it’s time to start our experiments and living in a small town does not make it easy to get those items quickly. Often by the time I get all the supplies together, we are already moving on. This will be a big help.